"The building collapsed. I am trapped with two victims. 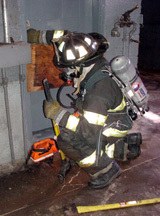 I am at the end of the hose. Heavy smoke. I am running out of air. Help. My location is a ... ". Then there is that dead quiet that no radio call can reach; measured only by the steady beep - beep - beep of the unmoving air pack. The trainer calls out "1 minute"! 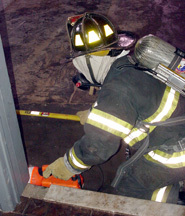 In the distance, you can hear the "Fast Team" fireman's tools bang the concrete floor and walls, exploring the dark as they move slowly along the hose. 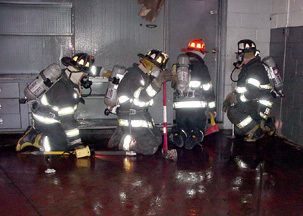 The hose takes them to a small opening that they must crawl through to enter an unknown space. After a quick search, they discover that they must break through another wall to reach the victims in the next room. As the trainer calls out the amount of time that has elapsed, one can sense the urgency in the team's voices and actions. 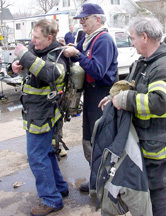 There was a steady rescue effort -- without panic -- but with great determination and professionalism. 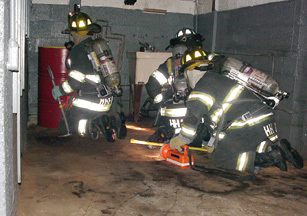 The squad breaks through the wall, discovers and retrieves three limp bodies, and pulls them back through the confusion to safety. 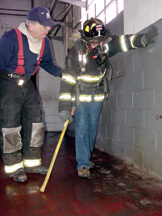 These training exercises were conducted Sunday, March 9, 2003 at the Boulevard Shell Station slated for demolition. 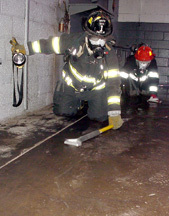 Hasbrouck Heights and Wood-Ridge Fire Department teams participated in three types of exercises: (1) primary search and rescue, (2) fireman locates victim but is trapped inside a room, and (3) fireman trapped with two victims inside a blocked room. The building doors and windows were boarded up. 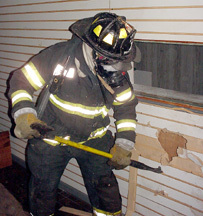 Doors were blocked and debris was selectively placed. 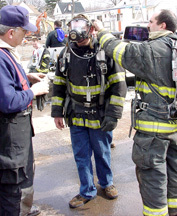 Wax paper was inserted into the fireman's mask to simulate visual conditions. 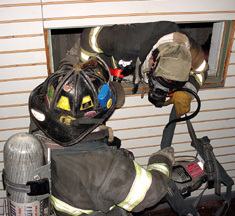 Firefighters were in full "turnout gear" weighing over 60 pounds. 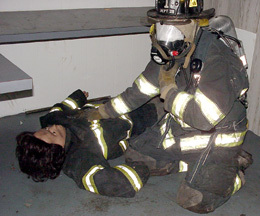 Several trainers closely monitored each team to insure personal safety, that correct procedures were executed, and that the training objectives were being met. 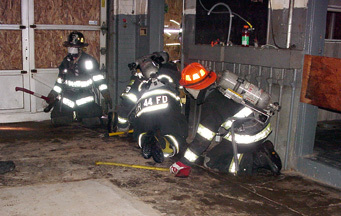 At the conclusion of each teams drill, an evaluation was given by the trainers who provided details, clues and tips to improve effectiveness and survivability in dangerous situations. 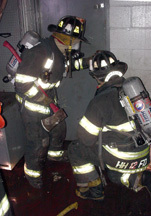 Firefighters were briefed on the exercises. Ready to face the unknown. 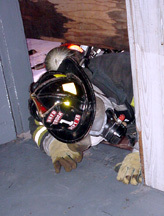 Firefighters practice basic primary search and rescue techniques. 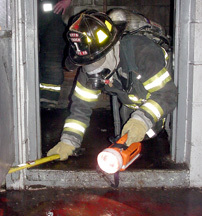 "Be prepared for the unexpected" -- the trainers locked the exit door. 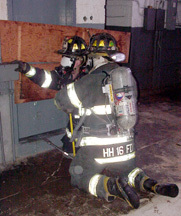 In one exercise, once the victim was located, the exit door was then blocked trapping the fireman, separating the fire team and creating a rescue of the rescue scenario. 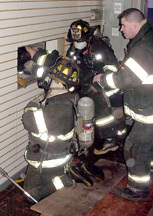 Another egress was found and the victim and firefighter were pulled through to safety. 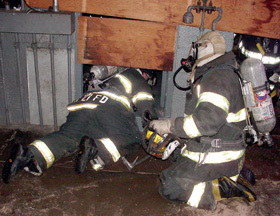 Breaking through the wall to rescue the firefighter and victim. When appropriate, the trainers would stop the action once the point was made. This allowed the wall to be used again by another team. 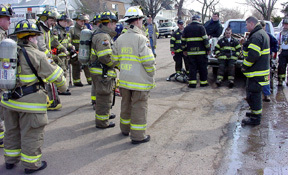 Councilman and Fire Commissioner Justin A. DiPisa (under the very watchful eyes of senior firemen) has an opportunity to get some hands-on training experience.